I accidentally developed a slight sweet tea addiction since moving to the south. Don’t judge me, it’s one of those irrisistable treats I’m allowing myself once in awhile. However, I have almost completely eliminated sugary beverages from my diet over the past several years, and feel guilty about drinking even one glass of sweet tea in a week. To lessen the guilt I knew we had to come up with a way to make our own less sinful version of this southern favorite. As we see it there are two problems with sweet tea: 1) it’s a sugary drink that should only be enjoyed in moderation, 2) it’s hard to find a source using healthy ingredients. The answer to the first is to drink sweet tea as a treat and not an every day staple – use good ole water as your staple. The answer to the second is not as easy. In Michigan the only place serving sweet iced tea was a certain fast food restaurant – and since we refuse to support fast food we could never get our hands on this delicious Southern drink. The problem with grocery and convenience store sweet tea is the typical choice of high fructose corn syrup and/or aspartame as a sweetener – not doing that either. There are a few brands of organic sweet tea available but they’re too expensive, and there is a better solution. Our solution is the same as always . . . make your own and do it with healthier ingredients. Matt has been talking to the locals here in North Carolina for the past few weeks trying to gather all the tips he could on making the best lightly sweetened, healthy sweet tea. One local suggested we purchase a Mr. Coffee Iced Tea maker, which we decided against since we’re trying to keep kitchen appliances to a minimum. Another southerner told us we needed 2 cups of sugar per gallon of sweet tea, and a Texan brother-in-law (who shall remain nameless) told us true sweet tea needed half a bag of sugar per gallon! Since we like our teeth and want to avoid diabetes, keeping the sweetener to a minimum is a must. Matt’s step-sister and the repairman who fixed our dryer today both suggested the approach we liked best, so while I lay in bed sick, Matt tinkered away in the kitchen concocting the perfectly sweetened, healthy, homemade sweet tea. Mmmmmm . . . some things are just worth getting out of your sick bed for. Note: use the tea you’re comfortable with, organic or otherwise. After sweetener is dissolved, fill the gallon container with water and ice, stir again, and put in the fridge to chill. Aside from organic cane sugar and raw honey the only other sweeteners I recommend are maple syrup and organic stevia powder. Like your tea, your choice of sweetener will be unique; use what you like and let others use what they like. Steer clear of artificial (aspartame) and heavily processed sweeteners (white sugar), use in moderation and you’ll be fine. Note: if you’re diabetic be sure to adhere to your doctor’s recommendations for sweeteners. Sweet tea is so good that many people don’t like waiting for it to chill in the fridge. If this is you then add ice to the container before pouring in the hot tea. Most people buy the tea in bulk because they go through so much. I’ll say it again . . . buy the brand and type of tea YOU’RE comfortable with. Remember, it’s DIY tea so do it yourself the way YOU like. Keep the sweetener light and drink sweet tea as a treat. Discipline yourself to drink pure water most of the time so you can enjoy a nice refreshing glass of healthy sweet tea when you want to indulge a bit. Although Matt sweetened ours with a mixture of organic cane sugar and honey you may prefer one of the other recommended sweeteners. What about the tea? Do you splurge on your favorite organic brand or stick with the old southern standbys? This is a call to all sweet tea lovers out there. Share your tips on how you make homemade healthy sweet tea! at least 10 minutes then filter through a fine mesh strainer into gallon pitcher, add desired sweetener, stir till dissolved then fill with cold water, chill overnight so as to not weaken with melting ice. Also filtered water makes the best tea. I worked out a similar lower sugar version as well, and I add a touch of vanilla extract…makes me believe it’s sweeter than it is! I use 1/4 cup cane sugar and a splash of vanilla extract for 2 qts of tea. Love that idea Kelley…we’ll have to try it! I am a native to NC, and recovering addict for Mcdonald’s swwet tea. When I was pregnant, I started living healthier, which led to homemade tea. I started with about 2 cups sugar per gallon, but each time following reduced by about a quarter cup. The perfect recipe for me now is half cup sugar to a gallon of tea made 1 bag stronger than whatever the box says. I discovered I can taste the tea leaves more than the sugar (similar to sweetening to enhance a great cup of coffee). I make tea pretty much the same way. . . my son got me hooked on it a year ago when I was visiting them in MO. My granddaughter has been drinking sweet tea in her sippy cup since she was a baby so I can relate to all of you southerners on this one. I always tease my daughter-in-law about her having been born south of the Mason-Dixon line. It has become a routine joke between us. I love southern girls! I also love your blog, your recipes & your great ideas! My new project is making enzyme cleaner – it’s going to be hard to wait for it to be ready to use though. im a big sun-tea fan, i make it alot in the summer. i dont really have a recipe, i just fill up my big glass tea jug ( i have no idea how much it holds) put in 4 big tea bags and let it sit in the sun all day. then in goes about a cup or so of sugar and good glug of lemon juice. mmmm…..so good! i make it for get togethers alot (along with my homemade lemonade) and it is always a hit! 1 gallon of water boiled, take off of stove, steep 4 family size tea bags, decaf Luzianne tea bags, then stir in 3/4 tsp of pure Stevia. (Pure Stevia Extract Powder by Kal sold on Amazon.com) The stevia I use is pure extract, no fillers etc….If you like it super sweet, then use 1 full tsp.of Stevia. Thanks for the pure Stevia tip! I too ‘fell into’ the sweet tea thing when I moved to NC. But it didn’t take long to decide I much prefer my old tea. I too like Luzianne, but prefer the varieties of Celestial Seasons most of the time. I prefer what we call ‘sun tea’. I never boil the tea, nor the water. I just put my tea bags into a jar of water, (a gallon at a time is best), set out in the sun. It doesn’t take long down here for it to ‘brew’. I’ve heard one can get the same results just putting it on the counter, but have not tried that. We drink it with no sweetener as it is not bitter when made this way. But for those who wish to sweeten it, I am a strong believer in raw honey. Doesn’t take much. That stuff called “sweet tea” is just too much like syrup to me. I only posted because I didn’t notice anyone mentioning the ‘sun tea’ option, and thought perhaps someone might care to give it a try. Lots of good input already from others! cheers! I’m in the deep south but me Mum is English. When I was a child, we did a taste test. Mom bought all the varieties of tea and we tried them all. Sorry y’all, but Liptons was the worst: bitter. I won’t even drink Liptons. Even their herbals are bitter. Winn Dixie tasted like oatmeal, Constant Comment like roses. Luzianne is OK but not the best flavor and somewhat powdery. The Best was A&P (makes sense: the Atlantic and Pacific TEA company). I have followed that brand since to National, Superstore, and now Walmart’s BestBuy. Unless you can find good English tea (breakfast or otherwise) like PGtips, try Walmarts. This is EXACTLY how I make my sweet tea (give or take a bit of sugar, depending on my mood)! I tend to make it more often in the spring and summer. I don’t usually feel guilty about drinking so much tea, since we don’t really drink sodas and are usually drinking so much water during that season. This recipe works with so many different brands and flavors, it’s great! I will try some of the healthier sweetener options (maybe then I will make more?). Boil water, when boiling stops, drop in lemon & steep tea. Add honey & enough water in pitcher to make a gallon. Compost lemon & tea bags. I make this about every other day – it doesn’t last! To me, the honey makes it sweeter than sugar, so I don’t need the 3/4 cup of sugar I used to use (or Splenda). I suggest using the green tea – it’s great & a good anit-oxidant! We did have a neighbor tell us to try green tea…and I’m definitely going to swap out sugar for honey and see how I like it. Thanks Jane! I’m a Floridian too and I agree to the sweet tea not being boiled. Also I occasionally add orange juice(fresh) or passion fruit purée (also fresh when available) instead of sugar. We had it that way in Hawaii. In a restaurant we now ask for half and half tea ( half sweet, half unsweetened) to save on sugar. Too much sweet tea can cause kidney stones so we’re careful not to indulge in the high sugar kind. I was wondering if we would hear from anyone using Xylitol in their sweet tea. 🙂 Thanks for sharing Jessica! Agave is not too bad since it is super concentrated. A little goes a long way. Raw Honey also goes much longer than the “commercial” brands. I tried McD’s Sweet Tea only to find it tasting of just sugar water. Never again. I remember Meadow Tea from our yard…I never liked it much but it was free! I don’t Heather, maybe someone else can chime in. I think teas for the most part are gluten free. I don’t know what would be added to a tea that would contain gluten. Oh gosh, never boil the tea bags, only boil the water. I like sweet tea but use only one cup per gallon and that’s certainly NOT how I was taught to make it. I’d rather have it so sweet my teeth hurt but…if they hurt now they’ll certainly hurt later so it’s one cup per gallon of tea. I’d think worse of you if you lived in the south and didn’t drink either sweet iced tea . A lot of NC and SC folks drink CheerWine which is way to much for me but I know folks who drink it like water; ugh. Adding 1/4-1/2 Teaspoon of baking soda prevents bitterness and makes the tea have a smoother flavor. We love sweet tea, but McDonald’ s nasty sweet, yuck. We go through a gallon a day between two of us, and just use our coffe marker to brew 4 family size bags of decaf Lipton & 8 cups of water. Sweeten with a cup and a third of sugar and fill it up to a gallon. I used to try to use healthier sugar but it is just too expensive! We use 3/4 cup sugar and 8 teabags (Lipton) per gallon and we make counter-top sun tea. Here’s how it works: Add sugar to the gallon pitcher and some add hot water (we don’t boil ours, just heat in the microwave) and stir, then fill the pitcher the rest of the way. Add the tea bags and put on the lid leaving the strings hanging out from under the lid. Let it sit on the counter until brewed, give it a stir then chill in the fridge. Great update with community input, Matt and I am new at this but just have to add a couple of comments. I use only about 3/4 cup of cane sugar that I buy from the Latino section at the grocery store or from a Hispanic Store. The sugar is not really white and not overprocessed-better for you! Then I add 2 small packets of Stevia. This way we are beginning to cut back on the amount of sugar little by little. Also, being from Tennessee we always boiled our tea for a couple of minutes and then steep because we LIKE the slightly bitter taste because the sugar “softens” it just a bit and yet leaves a slight “Kick”. Also, if you let it chill it makes it taste even sweeter! I have used “off brands” of tea for years like “Great Value” or Best Choice, etc. and have saved money because Pekoe tea is Pekoe as long as you prepare the tea to your liking unless of course, you buy organic. One more thing, you can dry the tea bags on a paper plate, keep adding till you have about 16 family size bags then you can recycle them in a “tea sock” (because they can come apart on a second boil) and make another gallon!! Then put whats left in the compost pile or rose garden! Enjoy! Okay y’all, we’re going to update the recipe based on community input – boil the water THEN put the tea bags in to steep for 10 minutes. Put sugar in pitcher, pour hot tea over it to dissolve, then fill with ice/water. I wonder why you wouldn’t just dissolve the sugar in the HOT tea and then add to the cold water? Yes, Luzianne for iced tea!! We don’t boil the tea, it gets bitter and we don’t squeeze the bags either. We pour the water over the tea and steep. We fill a gallon container half full with ice and water and add the hot sweet mixture in. then fill to top. Less ice is needed in the glasses, keeping the strength. ps… love the raspberry zinger… have used red zinger since 1990! We put the sugar in the gallon container and pour the hot tea over it to dissolve, 6 in one half dozen in another I suppose. Since moving to the south, I too have fallen in love with sweet tea! I am sooo very thankful you guys took the time to research this and share a healthy recipe!!! Lipton’s my fav, but I use generic sometimes as well. Sometimes I do four green tea, four black. granulated sugar, it goes away. *Add enough cold water to make one gallon. I find that refrigerating the tea makes it somewhat bitter, so I leave it on the counter and pour over ice. Also, I have discovered that purified water makes beautifully clear and tasty tea. Our tap water is from a well and has great minerals, but they cloud up and flavor the tea, so I use water from the RO filter. Yep, Betsy and I use only RO water for everything because, unfortunately our rental home has fluoridated, chlorinated city water. I am on a Raspberry Zinger kick. Put a bag in my large to go cup, add crushed ice and fill with water and then cap it. In about 10 min I have ice to ready to drink. No sweetner, I like it start up. I will refill my cup several times a day on that one bag, of course it is not a strong but the flavor is still there. Yummy! I just told Matt we’ll definitely have to try a fruity version now. I like to add one small bag of Raspberry Zinger to the other bags of regular black pekoe when I am making iced tea. It adds a raspberry undertone, but is not overpowering. I am a native North Carolinian now living in Georgia. Like Yvonne and Gina F. I do not boil my tea, because it increases bitterness. I bring 1 qt. water to boil, turn off the heat and add four family size Luzianne tea bags. I let it steep for 10 minutes or so then pour over 1 rounded cup of sugar in a gallon pitcher. (Mama used 2 cups/gallon but I cut it in half to be “healthy”.) After stirring the syrup I add 3 more qts. cold water and serve over ice with a slice of lemon. I have been drinking this daily since infancy and have all of my teeth, only a couple of fillings, and no other sugar-related diseases. I am in my mid-fifties. Every morning when I make my usual hot tea to take in my travel mug to work, I also make a 1 quart canning jar full of herbal tea… some kind of organic fruit variety usually…. right now I’m on a cranberry kick, but also good with spicier stuff like Bengal Spice or the like. I boil the water first then pour into each container. I use half a packet of stevia in each and its plenty sweet for me and WAY better than the yucky water at work, and WAY cheaper than buying individual servings to take to work. When I arrive at work, I stick it in the fridge and by lunchtime its lovely. I am trying to get used to less sweet stuff in my life as I have been reading a lot lately about how sweetners are inflammatory agents and inflammation is a contributor to so many medical problems. 6 – Pour sweetened tea over 3 quarts of ice and water. 7 – Stir and enjoy. 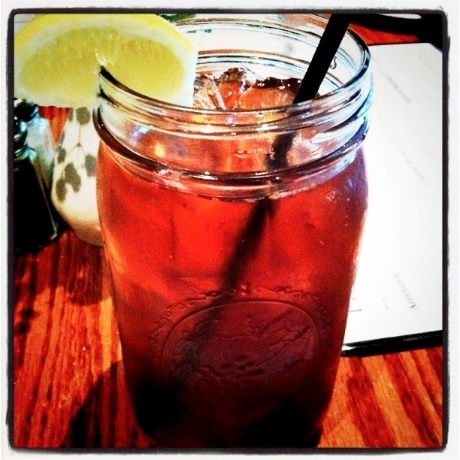 Mmmm…sweet tea! Stevia is great, if you find the actual leavesof ka’a he’e as we all it here, it has no calories at all, but you’ll have to learn how to manage the doses….. you can also have Paraguayan tereré to ease the hot weather…..
Our family of 4 (plus various friends that are always present) go through at least 3 gallons a week. I buy decaffinated Lipton’s or Luzianne which ever is on sale. Make simple syrup using about 2 cups of hot water and 1 1/2 cups of sugar, bring 3 family size tea bags to a quick boil in about 2 cups of water, pour into the simple syrup in my tea jug, refill the water in the pot and bring to a quick boil again, pour into the tea jug and fill with cold water. – mmmm need a glass right now. To Karen, what does the baking soda do? Karen, could I ask why you add the baking soda? Baking soda will take the bitter taste out of the tannins in the tea. I use a bit over 1/2 cup of simple syrup (equal parts of sugar and water heated until sugar is dissolved), to 1/2 gallon of tea. You can also put your tea bags in room temperature water overnight, for a cold brew tea and add your simple syrup to that. I am a native North Carolinian and was raised on sweet tea. A lot of us started out with it in our bottles and sippy cups. (yes, I still have all of my teeth!) Like Yvonne, we do not boil our tea. I boil the water first, add 8 tea bags, then turn off the burner and let it sit. I recently began adding one citrus and green tea bag which gives the tea a refreshing light fruity flavor. We add about a cup of sugar to about a gallon of water, add the tea, stir and enjoy! I have lived in California going on 21 years now and McD’s and Chik-Fil-A are the only places that serve sweet tea around here. Thanks for giving me a smile this morning and a flood of memories. That made me laugh that you had sweet tea in your bottles/sippy cups! 🙂 I love the idea of adding a citrus tea bag…we’ll have to give that a try. I won’t drink tea unless its sweet and I only like herbal tea. This is what I do. Nothing fancy. I boil water, add tea bags or add water to my tea bags. Let it steep. Add honey and drink. If I make a large batch. I will refrigerate it. It taste even better when allowed to sit overnight in the fridge or for several hours. I am a native Texan and sweet tea is our drink of choice. I have tried many different brands of tea but Luzianne Tea is the best for iced tea. And I don’t boil my tea. Boiling it tends to give it a somewhat bitter taste. Instead I boil the water and pour it over the tea bags and let them steep or sit for about 10 to 15 minutes dunking the bags every few minutes until you have a really dark concentrated tea. Also if you use sugar, whether it’s natural or white, make a simple syrup from it and you don’t have to shake to get it desolved. My husband is diabetic now so we have had to switch from sugar to Splenda which his dietitian recommended. Oh and when we used regular sugar I used 2 cups of sugar for a gallon of tea! Yvonne, I’m a native Texan too and they must have taught us all how to make tea the same way 🙂 You’ve got it totally right, don’t actual boil the tea bags, boil the water then remove water from the heat and add the tea bags to steep. And I would say one of the biggest keys to tea success is just as you said, making a simple syrup so the sugar dissolves evenly and easily throughout. The way we do this is put the sugar in the empty pitcher and then add the hot water your tea has been steeping in and stir until sugar is dissolved then add cold water as necessary to fill pitcher. We use 1 cup sugar to one gallon of water/tea in our house. Ahhhh, thanks Janise and Yvonne for the tip on steeping the tea bags after boiling the water! Janise…we’re going to try your simple syrup method next time so we don’t have to dirty more dishes or add an extra step to the process! 🙂 Thanks ladies! To dirty up less or no dishes, I put a cup of sugar in a gallon glass jar and then boil water in a tea kettle pour the water in the jar, stir in the sugar to make the simple syrup and then dunk my tea bags and hang over the side of the jar. Boil another kettle of water and add to the jar and cover with lid to steep the desired amount of time. Then I just add cold water, discard tea bags and stir and put in the fridge. The only dish that I dirty is the spoon to stir in the sugar. I too am a true southern that was raised on sweet tea. I make tea weekly because homemade is the only way we can get it since moving to Mi. This is the perfect sweet tea recipe! We make about a gallon a month and go through it immediately (family of 8). Using raw honey (alternating) to sweeten makes me feel a bit better about drinking it. Our favorite tea is Luzianne, but if i can find an organic, we may start having more tea. Thanks for sharing the recipe and story! I have been using Nectar for the past two years, and cringed at the price, until I discovered that Costco sells a 2-pack (36 oz bottles) for right around $10! Now I use it without economic anxiety for my coffee, tea, baking, etc.